Vinyl Windlace with correct "weave" or "basketweave" pattern. This is correct for the 1966 Mustangs and possibly other models. Please note that the 1964 1/2 and 1965 Mustangs used the "smooth" style windlace, which is our part number ST-110. 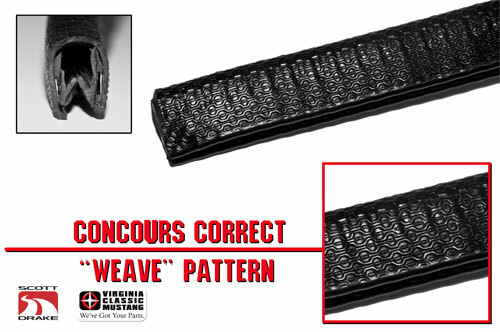 This "Weave" pattern has not been previously available. It features a steel core for easy, snap-on installation just like the original. Fastbacks and Coupes require 16 feet and Convertibles require 8 feet.